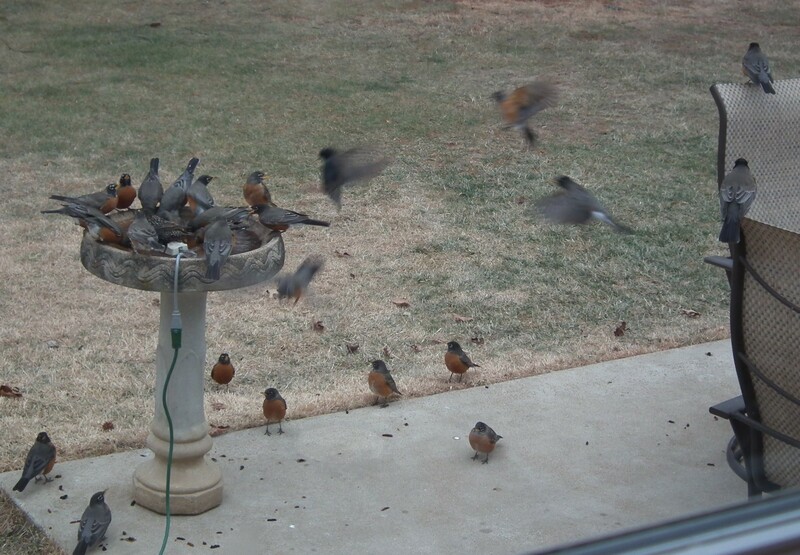 You are witness to my one and only Robin Invasion! 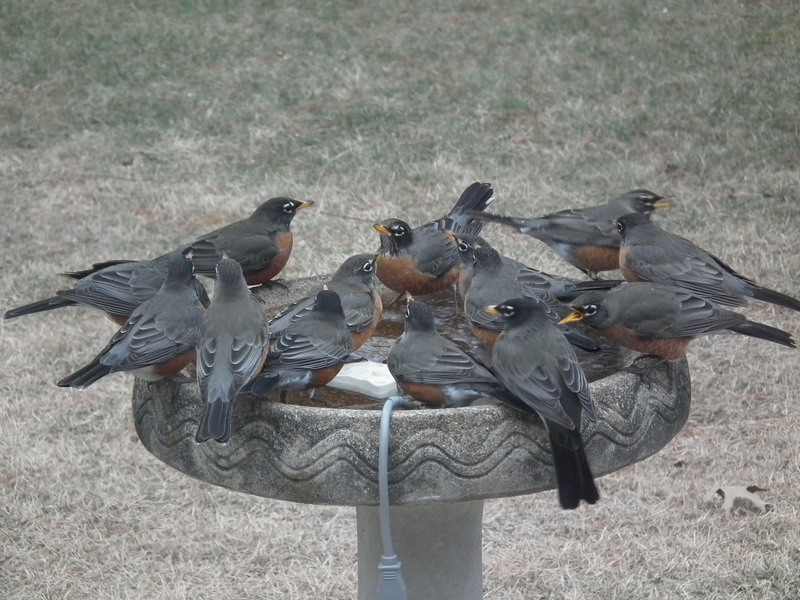 These photos were taken late spring, while the bird bath warmer was still in use. 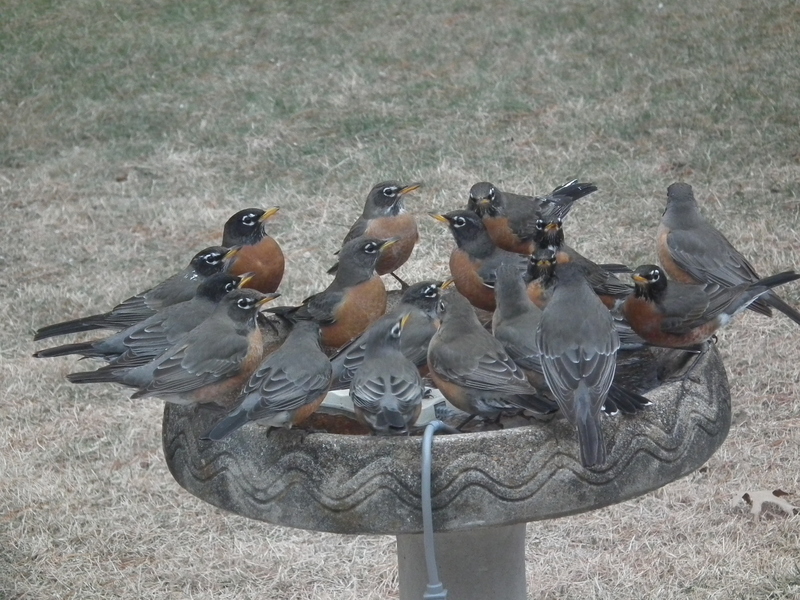 It started as a calm visit but caught my attention because never have I seen so many robins all together in one spot. 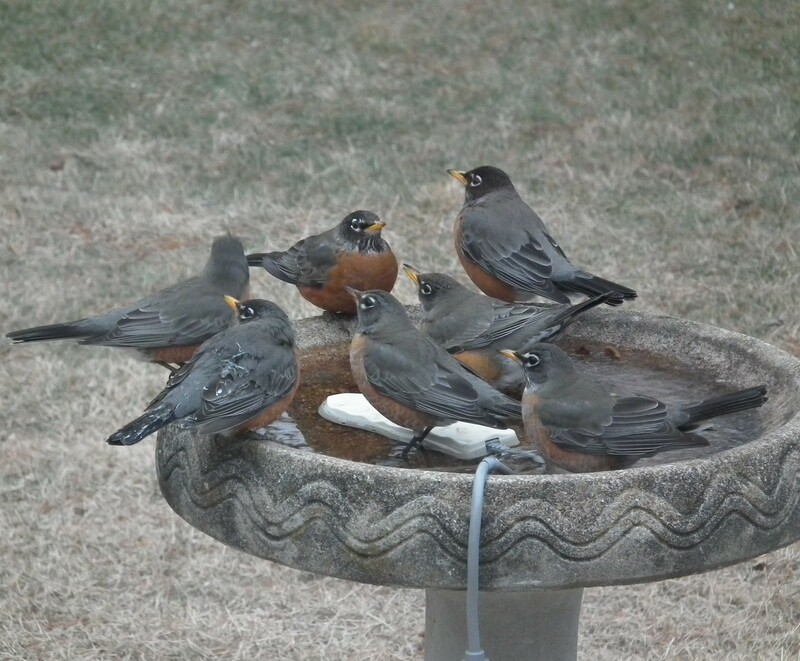 Within moments the news spread…..
Was this the Robin version of a Hot Tub party???? 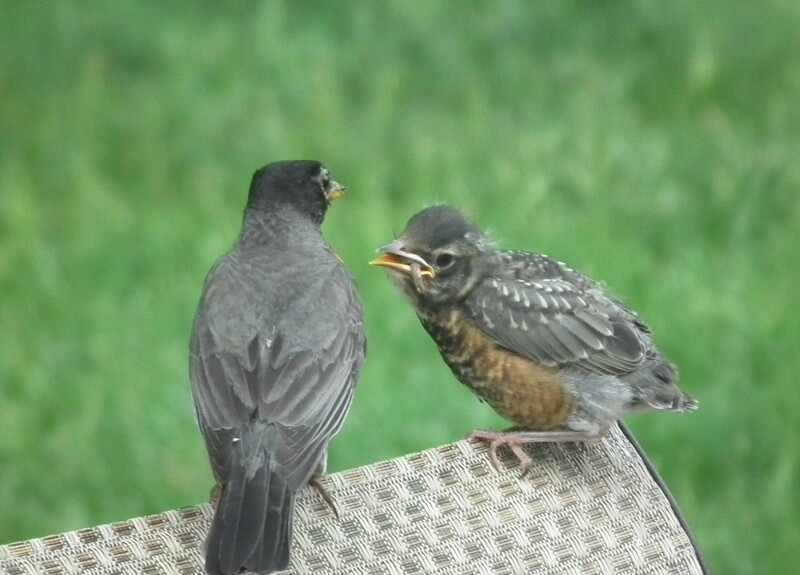 They became increasingly rambunctious and noisy as more robins arrived…. This photo still only shows a sampling. 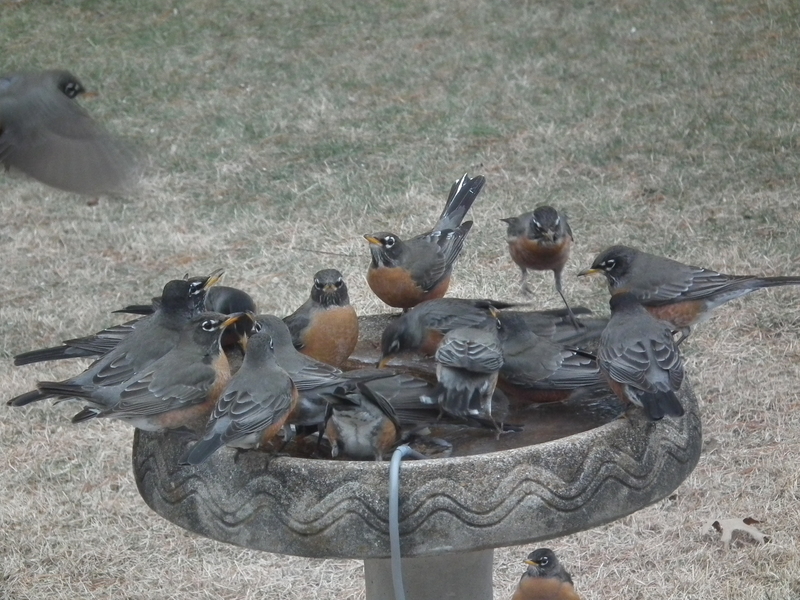 There were more Robins in the trees and in the rest of my back yard. They all partied for approximately 15 minutes, drained the Hot Tub, I mean, bird bath, dry and flew away leaving me to clean up the mess. 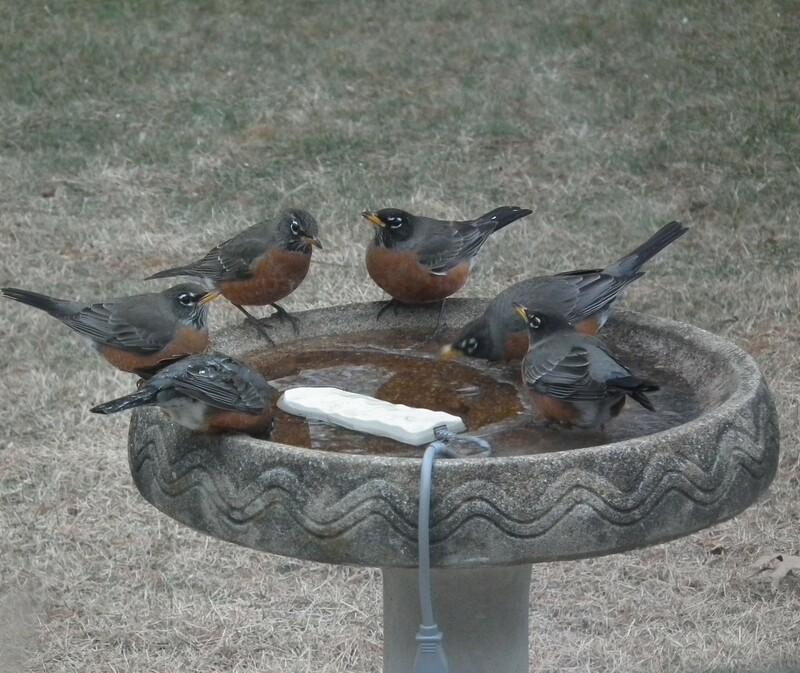 Please provide fresh water for our feathered friends if you can and thanks for reading! 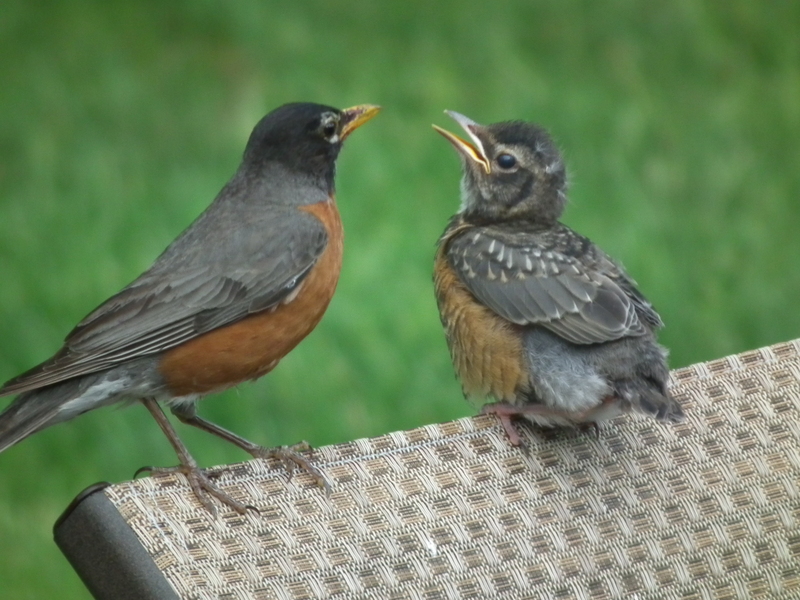 It’s was a family scene outside out my kitchen window – this was Fledgling Robin # 1. 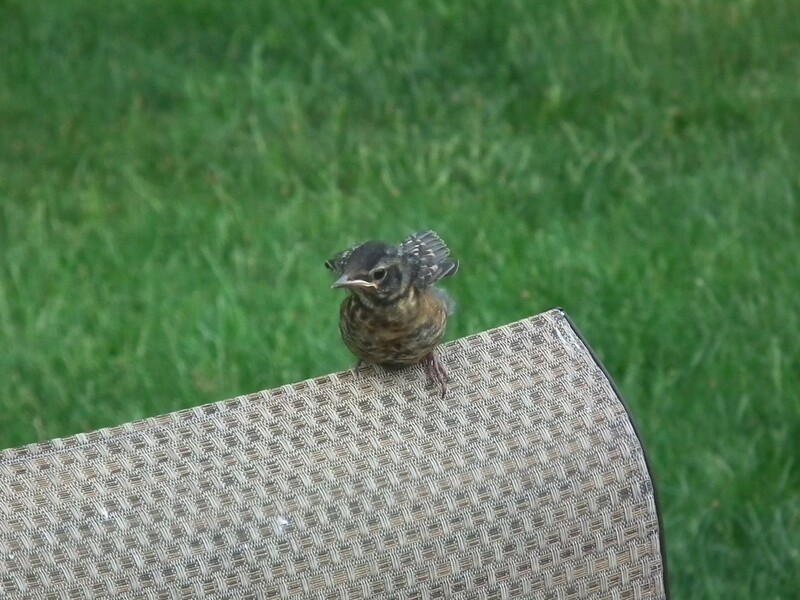 Just sitting there chirping and looking around. 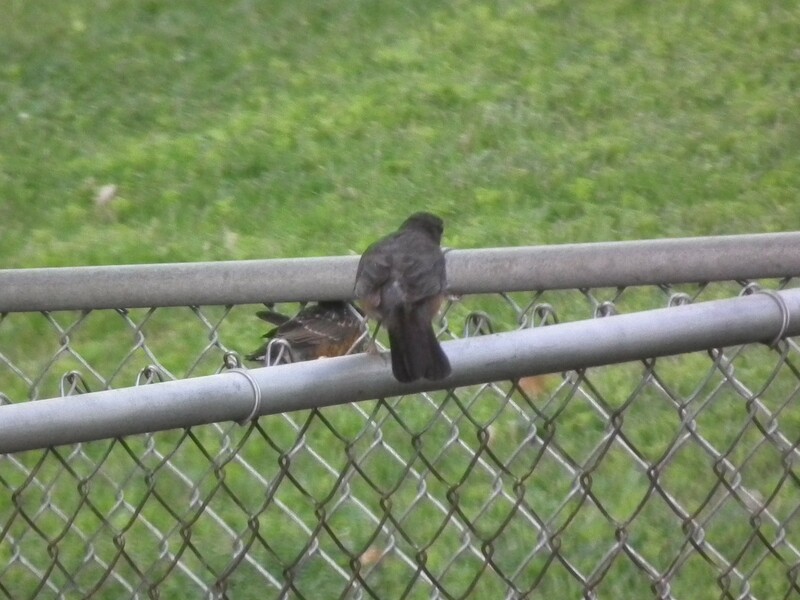 At times, Fledgling # 1 seemed a bit frustrated…. Then Dad arrived with a snack and it became clear to me what was happening. 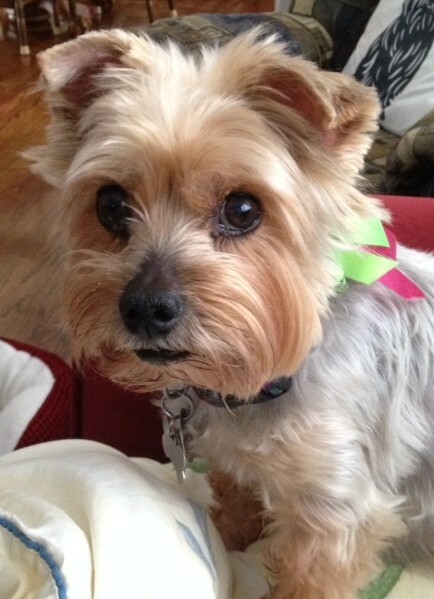 Then I noticed……. 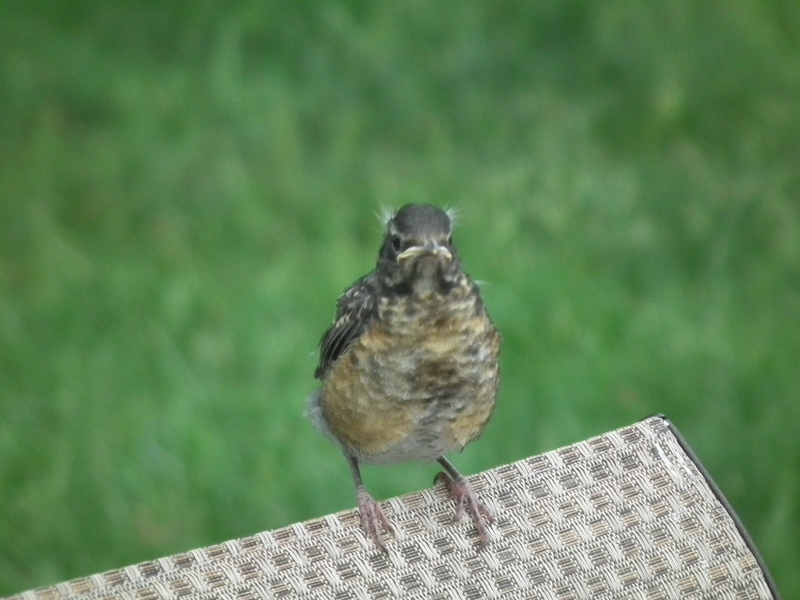 Sitting on my back fence was Fledgling Robin # 2. 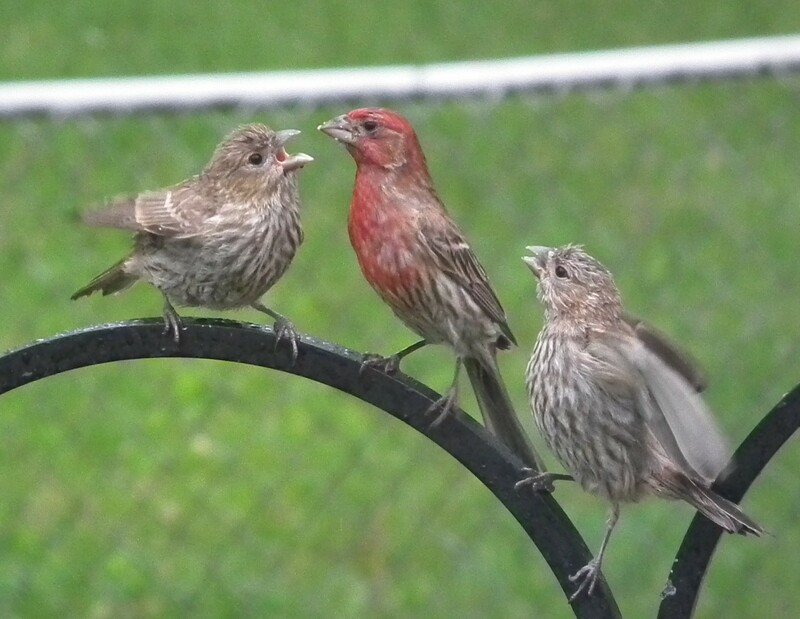 Dad was busy feeding both Fledglings ! Then I spotted….. 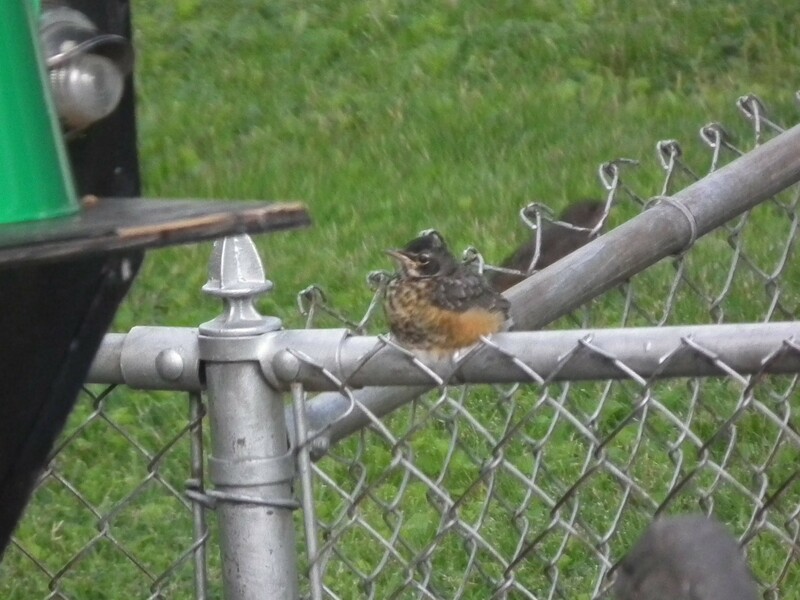 Fledgling Robin # 3 is sitting in the next door neighbor’s back fence. 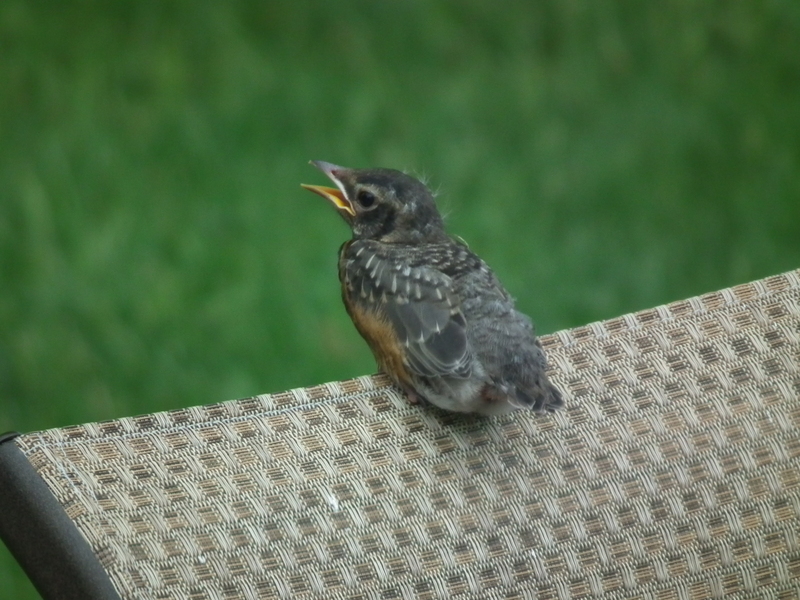 Poor Dad – I’m getting tired just watching him hunt for worms and fly from one chirping Fledgling to the next, all the while chasing away other stray birds he thinks might be a threat to his fledglings. .
Back to Fledgling # 1. 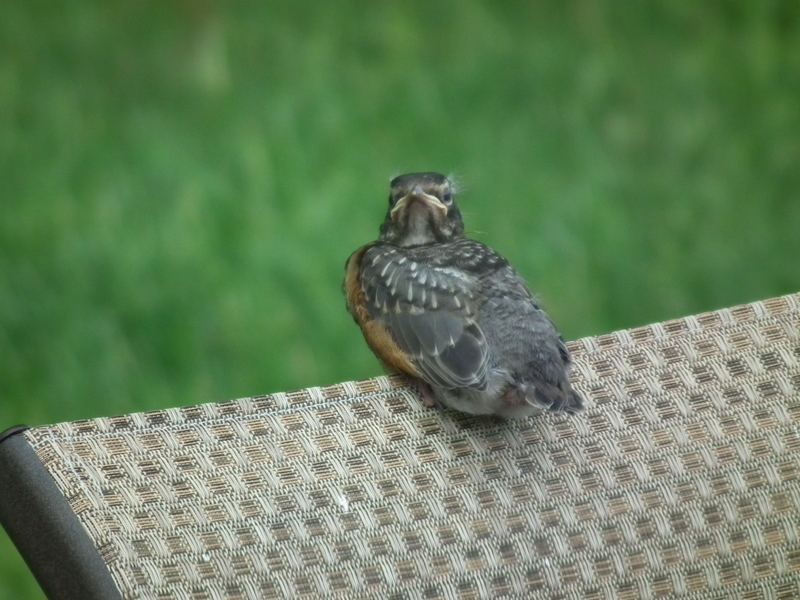 But then Fledgling # 1 decided to stay. How long did they stay there? Not sure, but a better part of the morning I’m guessing. I finally had to put down my camera and get some work done. When I finally looked back outside the whole family was gone. 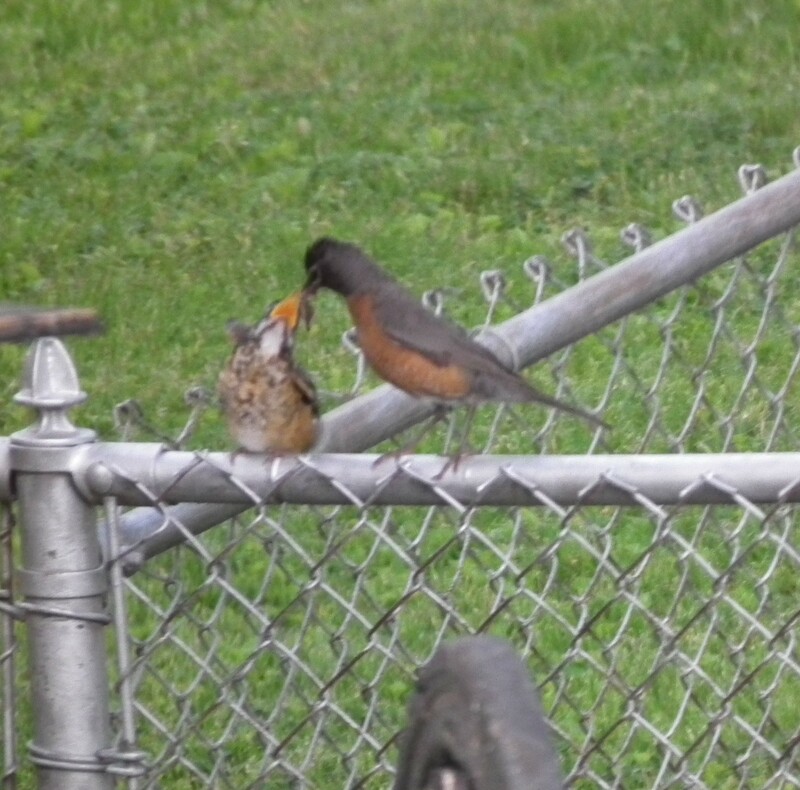 I’d like to think these are the same Robins , growing up healthy on my backyard bugs and worms. 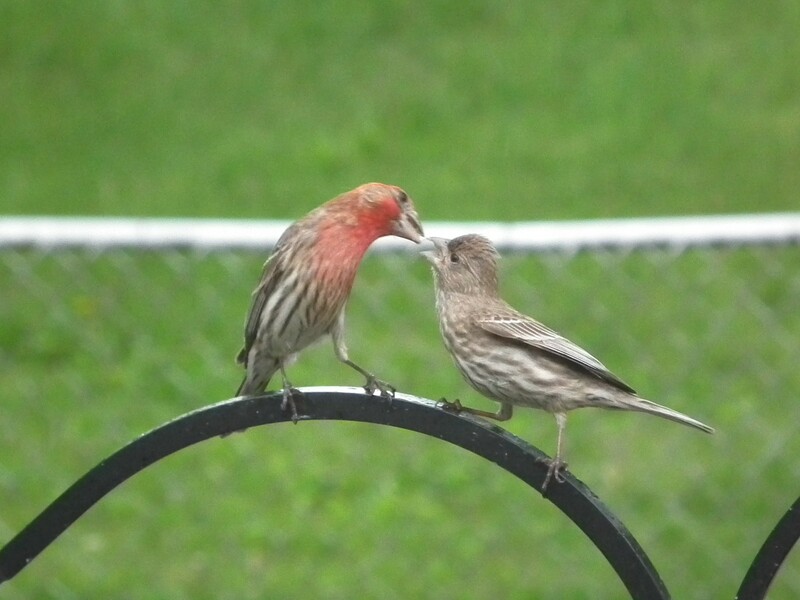 Spring is a great time to keep your eyes open for the new generation of our fine feathered friends. 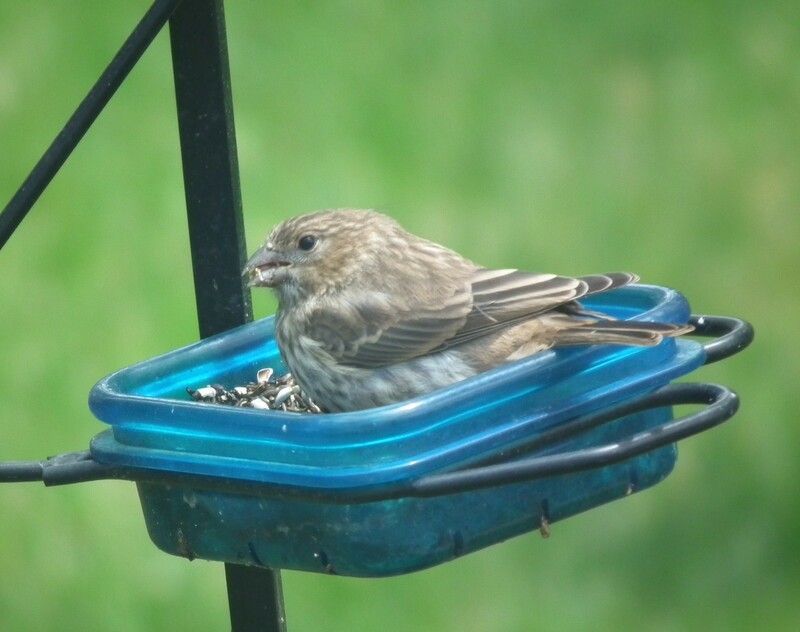 This feeder sits outside my kitchen window so by offering food and water for the birds, I’m blessed with a lots of feathered activity. 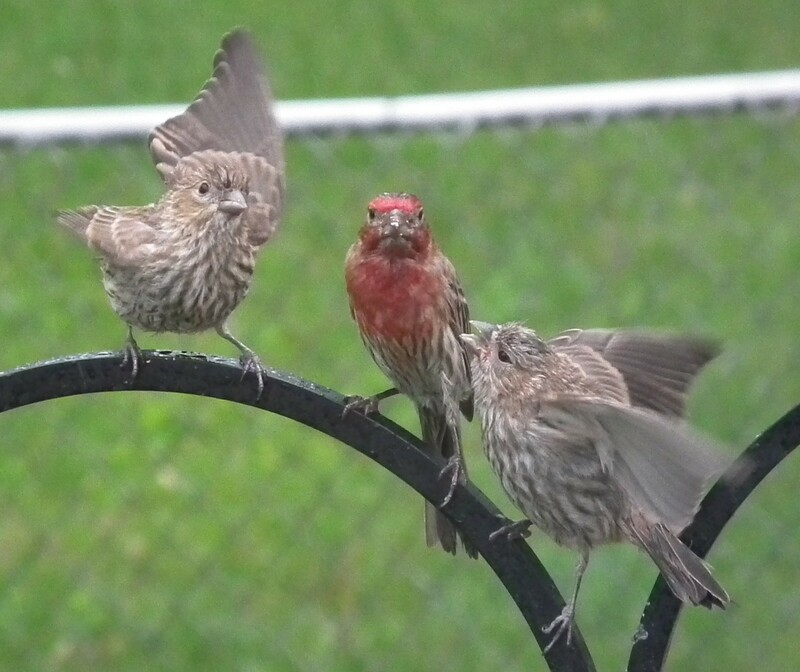 I think this Papa Bird, in the middle, is a House Finch (although the Purple Finch looks similar so I’m frequently confused) and he is helping/teaching the fledglings to find food. Oh dear, I think they spotted me in the window! Not sure if this is the same family or maybe a cousin? This baby has found a feast and made itself comfortable. 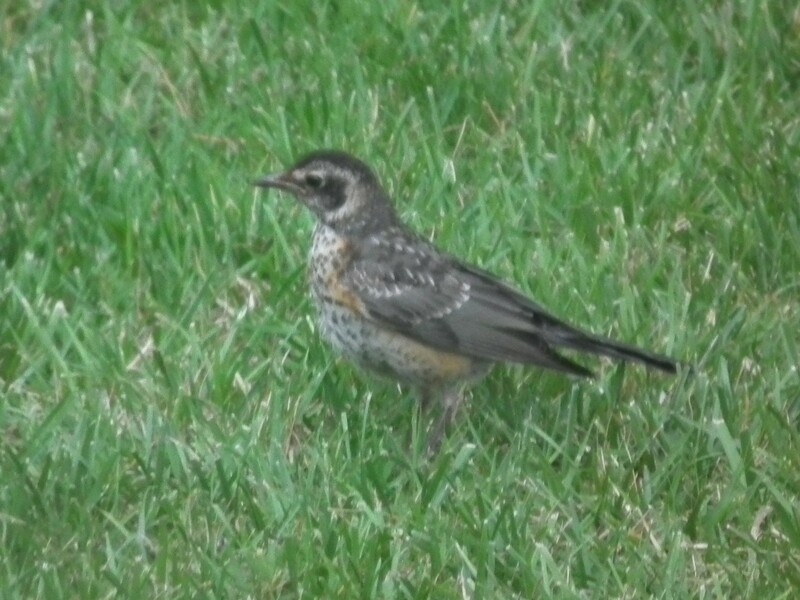 Is this is a fledgling starling maybe? 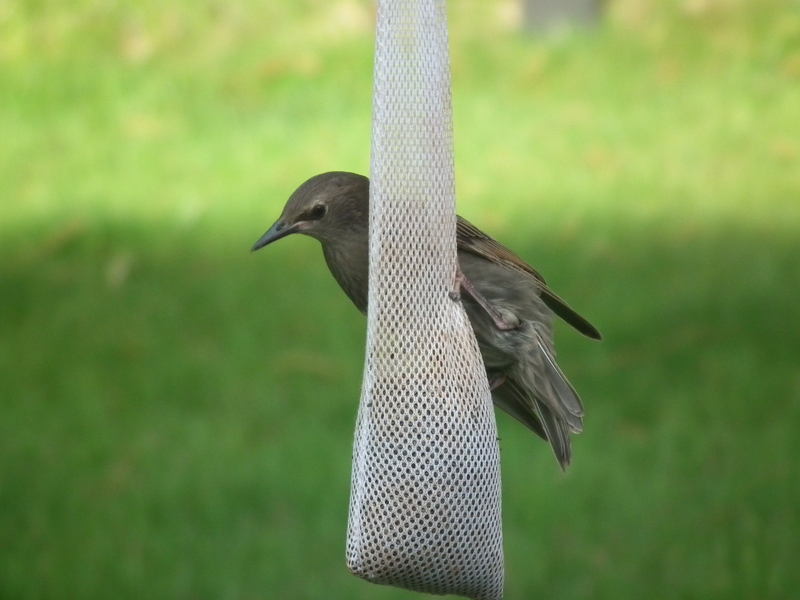 It has been hanging around my feeders for days and one afternoon I caught it having an identity crisis and trying to eat from the finch sock. 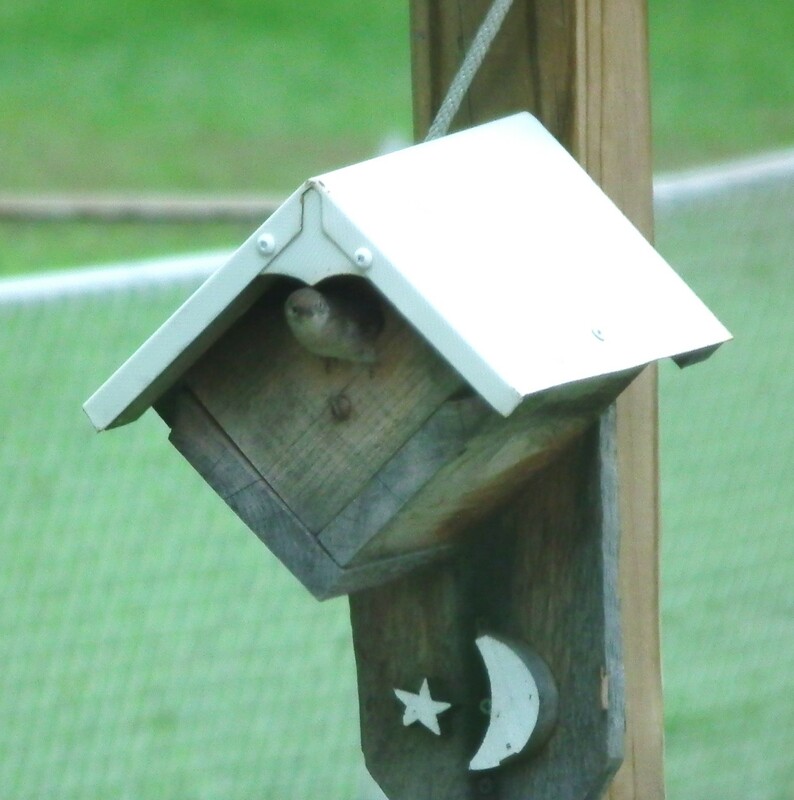 Lastly, there are two joyfully singing wrens residing in my wren house. So maybe there are some baby wrens in the future??? ?